GTS stands for the GNU Triangulated Surface Library. It is an Open Source Free Software Library intended to provide a set of useful functions to deal with 3D surfaces meshed with interconnected triangles. The source code is available free of charge under the Free Software LGPL license. The screenshots will give you an idea of what GTS can do. You can read the reference manual for more information. Help would be very appreciated and you are very welcome to contribute. A multi-resolution model with respectively 2918, 4849 and 15076 triangles. The original model is on the left and was refined using a midpoint insertion technique. George Supreeth has created a website called Painless 3D. His site has some very well written tutorials to help you get started with 3D and gSculpt. 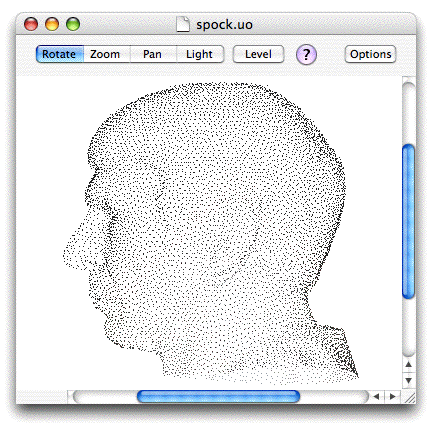 he UO file format is used to store 3-d point sets (collection of X Y Z coordinates).